Many building collapses during earthquake is due to fact that the bracing elements e.g. walls, which are available in the upper floors, are omitted in the ground floor and substituted by columns. 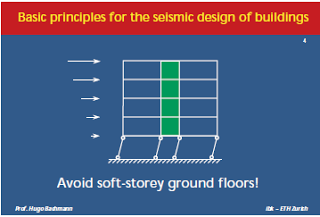 Thus ground floor that is soft in the horizontal direction is developed (soft storey). The columns are damaged by the cyclic displacements between the moving soil and the upper part of the building. The plastic deformations (plastic hinges) at the top and bottom end of the columns lead to a dangerous sway mechanism (storey mechanism) with a large concentration of the at the column ends.